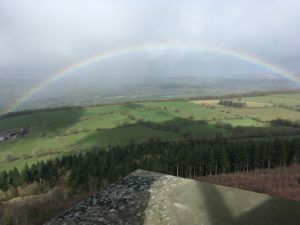 All about Flounders' Folly on Callow Hill in South Shropshire and the story of Benjamin Flounders, the man who built it. In mixed weather, views from the Folly can often be restricted, but they can also be spectacular at the same time. Thanks to Julian Walker for a perfect illustration of this – a fabulous rainbow as storms sweep all around the top of the Folly. All material on this site © Flounders' Folly Trust, charity reg 1084600, unless otherwise credited. Please ask permission if you want to reproduce any of it.